Provide your guests with a taste of the Sea! The 4 Station Coastal Series Portable Restrooms Trailer is built to impress, with a 2-tone Gray and White Nautical interior and soft ambient lighting. Coordinating vanity countertops with ornate Starlight Wave mosaic tile backsplash sets the tone for a fun and functional setting. This unit is completely self-contained, with a 100- gallon onboard fresh water tank and 395-gallon waste tank. A clean, fresh exterior greets each guest with heavy duty fold-up aluminum steps and rails for easy access. 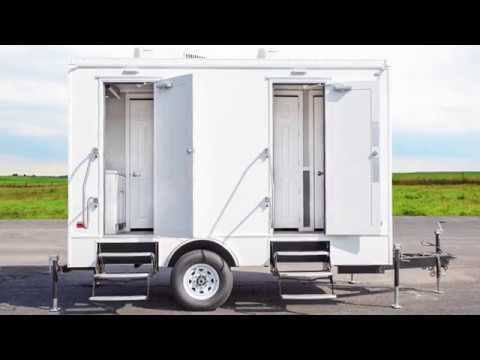 Your guests are sure to enjoy this 4 Station Coastal Series Portable Restrooms with the comfort of a fully climate-controlled environment maintained by air conditioning and heat strips, as well as a 3 Season package for cooler temperatures.